Edu-taining skippers take you on a memorable tour to explore West Coast scenery, wildlife richness and cultural heritage. Most people who come to this beautiful island for camping, hiking and picnics take a scheduled Sidney Spit ferry. This passenger ferry departs from the Sidney Wharf from June through early September. The cost of the guided tour, round-trip transport and beach stop is $425 for up to 12 people. ​Our service is ONLY offered outside the operational season/times of the Sidney Spit ferry. Cruise quietly among the coastal islands, passages and wildlife hot spots rich with seal pups, nesting eagles, comical oyster catchers and purple seastars. Harbour porpoise and orca whales sometimes even choose to watch us! Enjoy an interesting narration about Sidney's scenic waterfront, its diverse marine life, and the Gulf Islands National Park Reserve including Little Group islets and Dock Island. See http://www.parkscanada.gc.ca/gulf for more information about the Park Reserve. Tides and weather permitting, we visit a remote shell beach for some intertidal exploration. Binoculars are provided for wildlife viewing. Convenient departures from the Sidney Pier located at the foot of Sidney's Beacon Avenue. Note: All schedules and prices are subject to change without notice. During the first part of this tour, you ride along with the friendly passengers who commute on this fun shuttle ride between Swartz Bay and the private Piers Island. 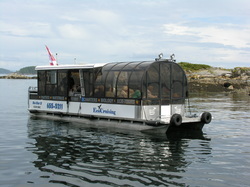 Then continue with your ecologist skipper on your own exclusive tour of islets and passages off the Sidney waterfront. Bring your camera for the world-class viewing of seals and eagles. 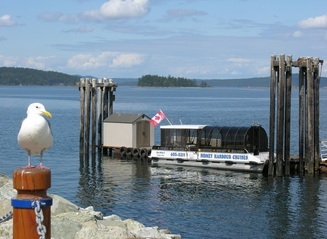 ​Departs year-round from the Canoe Cove Marina, near the BC Ferry Terminal at Swartz Bay. Convenient, free parking. Easy access for wheelchairs. All schedules and prices are subject to change without notice. Watch for eagles, seals, jellyfish, seastars and sometimes even killer whales in the majestic fjord serenity of Saanich Inlet along the remote mountain cliffs of Gowland-Tod Park. Investigate a deep water trap of giant prawns & squat lobster, and when weather and tides permit, explore a remote shingle beach. Contemplate the area's rich history from a First Nations' perspective, while gaining a lasting appreciation of this tranquil inlet and deep-water fjord. Departs from Brentwood Bay Marina, next to the Mill Bay Ferry terminal. Convenient, free parking. Tickets and reservations available from the Marina's EcoAdventure Centre.